Above photo: Tsukemono Sushi - a wonderful vegetarian sushi using pickles rather than fish. 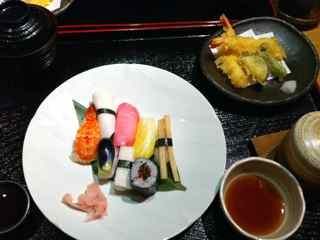 Japanese food is delicious, healthy, fresh and easy to prepare. The team at Japanese Healthy Eating is working hard to prepare easy Japanese food recipes that can be added to your weekly menu for easy healthy eating. With our legendary tastes of Japan. With the dedication of our forefathers. Nurturing and stirring people with our delicacies. Of course, rice is a Japanese staple. Rice is eaten with at least 2 meals a day. Yes, even for breakfast. If you`re interested in Japanese food, invest in a rice cooker. It`s an excellent easy healthy eating addition to your home. Rice cookers make all kinds of rice (even brown, basmati, long grain etc) perfectly. There`s even a timer on it so you can prepare it in the morning and it`ll be ready for you for dinner. It`s well worth the price tag. The Japanese diet contains a lot of interesting and delicious vegetable dishes including Japanese pickles. Fish is better than meat and the Japanese diet definitely favors fish. Sardines are popular here. While, I was not a fan of sardines, I am now. The way they are prepared here is delicious and sardines have such an incredible health value -especially in terms of calcium. We`ve got lots of Japanese recipes coming including easy sushi recipes! Stay tuned.